Having looked at teams and players who stand to benefit from a huge number of vacated targets heading into the 2019 season, it seems only fair that we turn our attention to players who could enjoy a similar boost. This time we focus on vacated carries, and the players with the most impressive advanced stats, metrics, and analytics profiles to exploit the opportunity void. We will look at the three teams who have among the largest number of lost carries from last season, according to Rotoworld, and offer some thoughts as to how these carries may be allocated in the year ahead. The Oakland Raiders signing of Isaiah Crowell should go some way towards replacing the absolutely huge number of carries the team lost this offseason. While there is still some speculation that Marshawn Lynch may yet return, given the team’s commitment to one more season in Oakland, there appears to have been little sign that the Raiders and Doug Martin would be reunited for a second go round the block. Lynch was far from terrible in limited action in 2018, as he enjoyed a 63 percent share of the team rushes in the first six weeks of the season. His Dominator Rating was a mere 24.8 percent, however, with a consistently poor game script no doubt affecting his dominance. Lynch endured a -5.53 Game Script in 2018, No.31 among backs. The Raiders were middling in their Run Blocking Efficiency for Lynch, with a 50.3 mark. Lynch, however, was making magic happen by himself at an elite level. He was No.4 among all running backs with 2.00 Yards Created per Carry, thanks in no small part to his 45.7 percent Juke Rate. This led all running backs last season. He finished No.23 in Evaded Tackles with 48. Now, remember, Lynch only played in six games. His eight evaded tackles per game pace would have seen him lead the NFL in this category also. Crowell was a middling athlete out of Alabama State, although he did post 6.6 yards per attempt in college. This figure is in the 88th Percentile. He lands with the Raiders after a similar sort of season to that enjoyed by Lynch, only Crowell was with the New York Jets. Like Lynch, Crowell was far from ably supported by his run blockers, with a Run Blocking Efficiency of 56.6 No.15 in the league. Like Lynch, Crowell was among the best at making his own yards, with 2.30 Yards Created per Carry No.2 in the league. If Lynch doesn’t come back, Crowell projects as the best bet to be the leading carrier for the Raiders. The only other notable backs currently on the roster are Jalen Richard and Chris Warren. Richard makes his NFL bones as a receiving back. He was one of the most productive ones in the NFL in 2018. He was No.7 among running backs with 68 receptions in 2018, No.6 in receiving yards thanks to his 607. However, he has two NFL games with six or more rushing attempts on his resume. Warren led the NFL in rushing yards during the 2018 preseason, racking up 292 yards on 58 attempts. However, his underwhelming 16.2-percent College Dominator Rating on 8.5 rushes per game for Texas combined with lackluster athletic profile suggests Warren is incapable of shouldering a primary back workload in the NFL. The Jacksonville Jaguars spent the fourth overall selection on Leonard Fournette in 2017. After the 2018 season, with Fournette still on the roster, they have a whopping 59.3 percent of their total carries left up for grabs. Fournette is poised to be one of the biggest winners of the still young NFL offseason. Fournette was only able to play in eight games in 2018, with six of them lost to a hamstring injury originally suffered in Week 1. He lost two more to suspension. One mandated by the NFL, the other team enforced. Fournette actually led the team in rushing attempts last season. Although his 133 carries were the 34th most of the running back position. Fournette was the focal point of the Jaguars offense. This is evidenced by his 34.7 percent Dominator Rating. This was No.4 among running backs and came after the third highest in 2017, 31.9 percent. However, there were two big differences between Fournette’s first and second seasons in the NFL that contributed to his poor production when on the field. His Run Blocking Efficiency as a rookie was 78.1, while the Jaguars provided Fournette with a +3.78 Game Script to enjoy in his first year. These numbers fell to 52.7 and -4.04 in 2018. A lack of wide open running lanes meant that Fournette had few opportunities to showcase his 97th percentile Speed Score of 116.0. Instead, he had to try and create on his own. This he failed to do at a spectacular rate, with 22.6-percent Juke Rate “helping” him to a meager 0.99 Yards Created per Carry. This was No.44 among running backs. 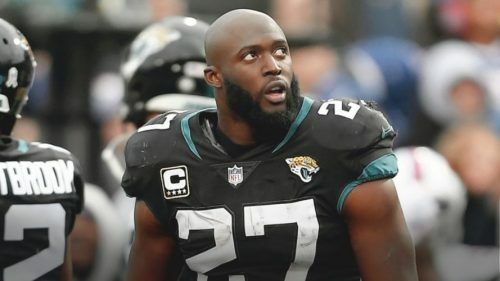 The Jaguars and Fournette are all friends again after a clearing of the air at the end of the season. The team has upgraded at the quarterback spot, bringing in Nick Foles to replace Blake Bortles (ironically, a move that frees up a further 58 rushing attempts from 2018). With Doug Old School Marone still calling the shots, the Jaguars figure to remain a run first team. Luckily for them, they have a player with a 21.8 touch per game track record chomping at the bit to prove himself after a lost season. Fournette will be looking to throw off his “injury prone” tag in the coming year. He could be a volume-based fantasy asset to cherish. 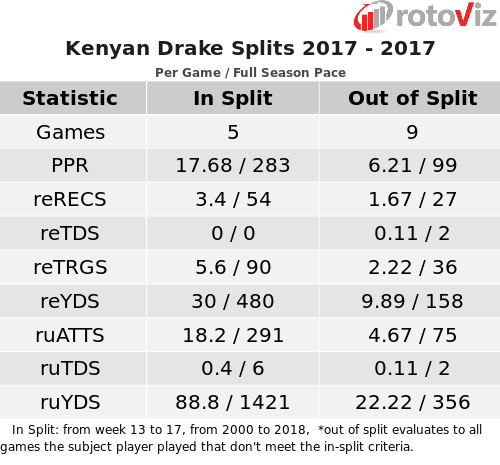 If not now for Kenyan Drake, then when? Drake came into the 2018 season on the back of unbridled enthusiasm, after a chance to showcase his talents in the closing weeks of the 2017 campaign not afforded to him at any other stage of his life since probably High School. In Weeks 13-17 of the 2017 season, Drake was a workhorse on the Miami Dolphins. He produced like one. So what was Drake’s reward in 2018, after these fine deeds to close out the previous season? The No.34 Opportunity Share among all running backs despite the No.16 Snap Share. Drake had 14 carries in Week 1 of the season. Over the next 15 games never had more in a single game. Indeed, he had only four more with double-digit carries, and one of them came in Week 17. Despite this throttling, Drake was among the most efficient running backs in the NFL when used. He was No.10 in Yards per Touch with 5.8 and No.16 in Production Premium with +16.6. All the while dealing with a far from nice 69.1 percent Run Blocking unit. Drake suffered from his being more elusive than explosive, however. He was No.7 in Juke Rate with 34.7 percent. But he was only 26th in Breakaway Run Rate with 5.0 percent. 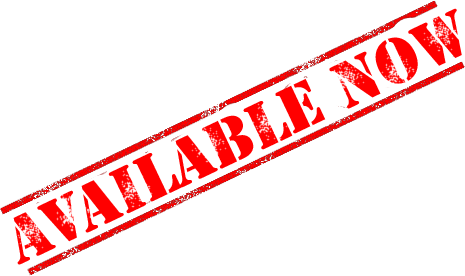 He could get out of the way of the first wave of defenders, but he struggled to elude their reinforcements. At the time of writing, though, Drake has only Kalen Ballage to keep him company on the Dolphins depth chart. Ballage is the very idea of a receiving back and has been since college. Ballage posted a 33rd percentile College Dominator of 20.6 percent, all the while commanding an 84th percentile College Target Share. He is not here to command the backfield touches for the Dolphins. If the job is to go to a back currently on the roster, it must go to Drake. In his favor is the identity of his new head coach. Brian Flores was the defensive play caller forced to watch Drake pull off the Miami Miracle last season. If Flores follows the trend of his mentor, Bill Belichick, he will have made note of players who have starred against him in the past. He will work to use them to his benefit in the future.